Nancy is asked to locate a stolen pearl necklace that is unusual and very valuable. She soon learns that strange and dangerous people are responsible for the theft. They harass her at home and intensify it when she and her father go to Japan, and they finally manage to kidnap Nancy and her friend Ned Nickerson when she returns to River Heights. Through clever sleuthing, Nancy is able to penetrate the rites of an amazing group of pearl worshippers, some of whose members are far from devout, and she uncovers underhanded dealings of certain employees of World Wide Gems, Inc., a tremendous international jewelry company. 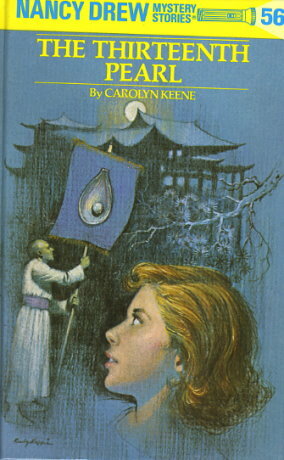 Readers will love accompanying Nancy, disguised as a Japanese girl, in this adventure in Tokyo.